Application for medical license in Massachusetts as of 2015. See Planned Parenthood League of MA (abortion clinic) practice location on page 48. 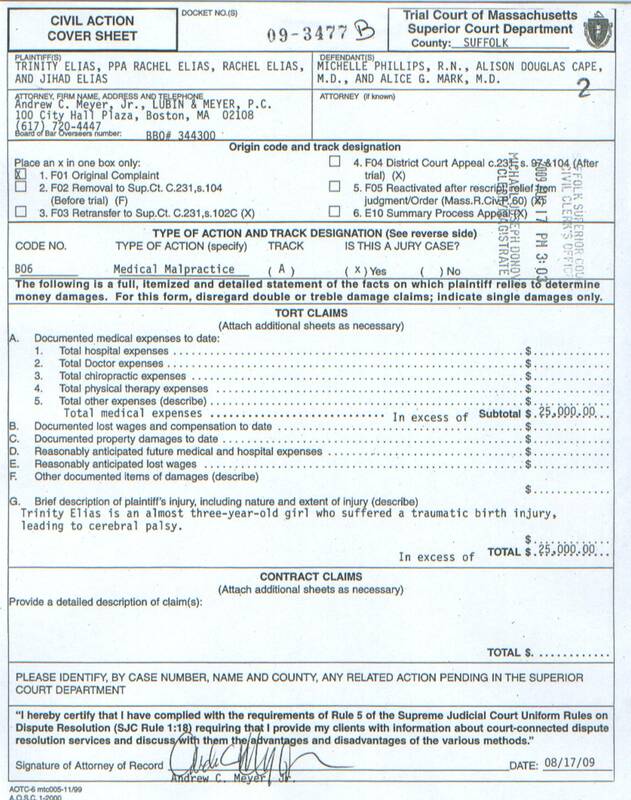 2017 MA medical license application file for Alice G. Mark. See page 50 for practice location for Planned Parenthood League of MA (abortion clinic). TX medical license profile for Alice Grace Mark. MA medical license profile for Alice G. Mark. MA medical board response letter regarding open complaint against Alice G. Mark. Patient Amanda Davis sues abortionist Alice Mark and Planned Parenthood League of MA for a botched abortion. On Feb 4, 2016, Dr. Mark performed Amanda's abortion at the Boston Planned Parenthood. After the abortion, Amanda suffered extreme bleeding, passed clots the size of a baseball, suffered fainting spells, and became to weak to walk. The abortion clinic never returned her repeated phone calls for help. Amanda's condition continued to worsen, and she was confined to bed and unable to work. Two months later, on April 4, 2016, Amanda's worried mother took her to Massachusetts General Hospital "curled up in a ball." Here Amanda learned that her abortion was incomplete, and the abortionist Alice Mark had left 3/4 of the fetus intact in her uterus. "This was the first time Amanda was advised that the procedure at Planned Parenthood was incompletely performed, and it caused her severe emotional shock which has since been followed by a deep depression and mental anguish." See pages 14-15. Amanda sued the abortionist and abortion clinic for malpractice. Case summary. Alice Mark is named as a defendant. Malpractice lawsuit against defendants including Alice Mark, MD. "Trinity Elias is an almost 3-year-old girl who suffered a traumatic brain injury, resulting in cerebral palsy." The Okoli family sues Dr. Alice Mark in a malpractice case. 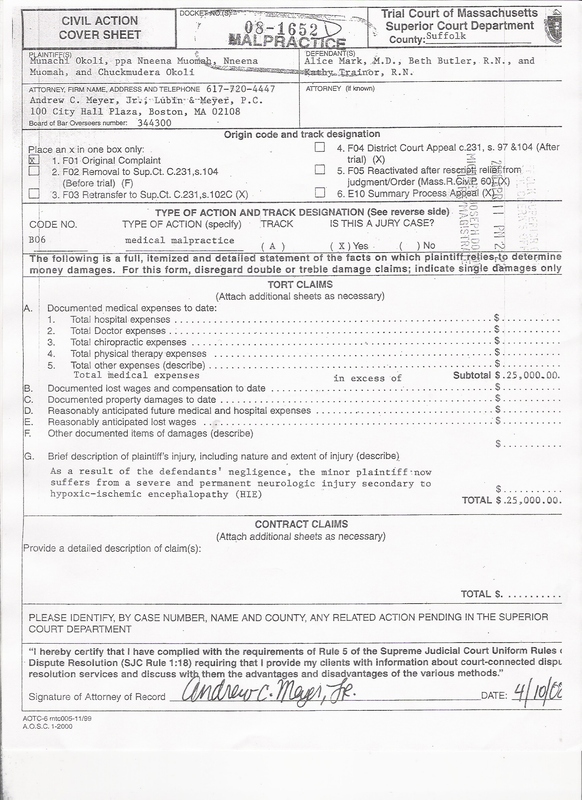 "As a result of the defendant's negligence, the minor plaintiff now suffers from a severe and permanent neurologic injury..."
Original complaint in malpractice case against Alice Mark. Amended complaint in malpractice suit against Alice Mark. Case docket with list of court actions. Amanda Davis files a malpractice lawsuit against abortionist Alice Mark and Planned Parenthood League of Massachusetts. 2019 lawsuit that alleges a woman received a "substantially" incomplete 1st trimester surgical abortion by Alice Mark at Planned Parenthood in Boston. When cramping and bleeding continued she tried contacting PP, but no one at PP would return her calls. No follow-up was scheduled. Patient only was properly treated at a hospital a full two months later. 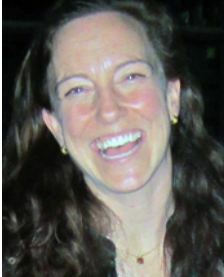 Alice Mark is associate medical director at the National Abortion Federation. May 2016 -- List of doctors/abortionists at Greater Boston PP, including Alice G. Mark, MD. 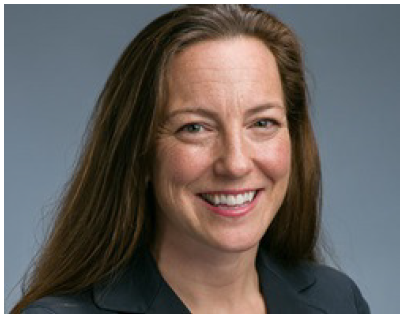 Jan 2015, article by Alice Clark -- "Meet the expert: up-to-date clinical advice on abortion." 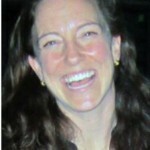 March 2013 -- List of doctors/abortionists at Greater Boston PP, including Alice G. Mark, MD.